If you are interested in what is going on in Lima, there are a variety of ways you can show support. We are excited to be partnering with United World Mission to work alongside the Peruvian church and help people have a daily encounter with God. You can be a part of what God is doing in Peru by joining our support team. 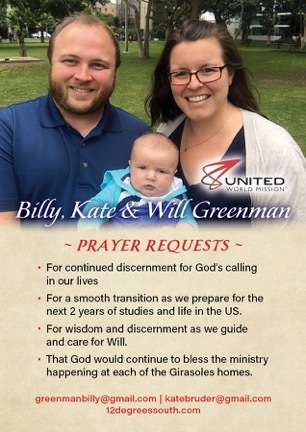 Download a copy of our prayer card. We are needing to raise new support in commitments of approximately $600 per month and in addition are looking to raise support for one time expenses. Funds from this account would help cover travel expenses as we visit current and prospective donors. Would you consider partnering with us? If you feel God has put it on your heart to support us, there are a couple of ways to give. Pick whatever is easiest for you! You can easily give online by credit or debit card on the UWM website. You can choose to give one time or set up a recurring donation with your debit or credit card. Giving on UWM.org is safe, secure and easy. Gifts are tax deductible in accordance with IRS regulations. UWM issues receipts for all online gifts. Any gifts will help, no matter what size. Thank you!